Annie and the Hedonists heat up the Oswego Music Hall with vintage jazz and swing when they perform on Saturday, February 2 at 7:30 p.m.
Special guest Larry Hoyt of WAER radio, will emcee the concert and a dance floor will be set up in the sun room. The venue is the McCrobie Civic Center, 41 Lake Street in Oswego. Annie leads the 3-man band and struts right to the heart of each sassy, nostalgic song and gives us a piece of her mind in a voice that sits comfortably alongside the greats of the American jazz tradition. 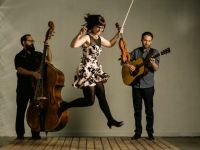 Her band mates, Peter Davis, (guitar, banjo, clarinet, piano, vocal), Jonny Rosen, (guitar, vocal) and Don Young, (bass, guitar, vocal), are first and foremost accomplished, serious musicians. The Season continues with Open Mic Friday on Feb. 15, guest hosted by Larry Kyle and on Feb. 16 with the robust fiddle and foot percussion of the April Verch Band on the national stage. For a complete performance schedule visit the website or pick up an event calendar or poster from the lobby in the McCrobie Civic Center or from the river’s end bookstore. The Music Hall is a non profit organization that has been run entirely by volunteers from its inception in 1978. Volunteers can earn admission to shows through various tasks— from running the sound board to making popcorn. Students can also earn credit for community service.